Take this tote bag with you to the library, meeting or convention. After attending many events over the past 25 years, I've learned that a sturdy bag is a necessity. Rather you are carrying papers to research or picking up items at a convention. You will love this bag! We see so many people at the conventions and at the library, we are all related somehow. So we will take your generational chart to custom print for the the reverse side of the bag. We recommend names only, so they are very clear to read, especially on a 5 generational chart! You can use a 3 or 4 generation chart as well. These are professionally made, multi stitched reinforced with canvas handles. So they are soft and durable! We guarantee our straps! Any issues with them and we will fix them. 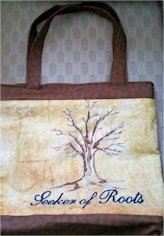 We offer fully lined with durable canvas totes or unlined totes. 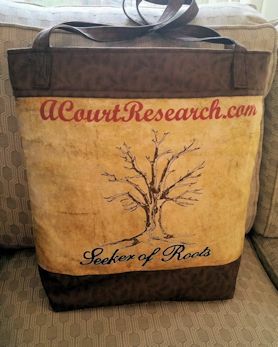 The printed portion of the bag with the Genealogy Tree with the parchment background. We have 3 styles of pockets: 3 open slots, velcro or zipper closing pocket. Please allow additional time to make these for you, as we have the fabric professional printed on canvas. We also offer the fabric of your generational chart if you would like to make something from it. We will need a picture or pdf of your generational chart, which we type into our program for the tree. The chart you send does not have to be typed. We will send you a copy of the chart to review for typos. 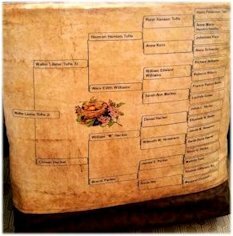 After you have approved your family tree, we will need 2-3 weeks to have your custom fabric printed and made into your tote. The bird's nest can also be a different image. Select a flag, coat of arms, country outline, ship or a family photo. NGS Special: choice of 1 open pocket or Velcro pocket included FREE with this custom chart tote! Contact for custom printing or embroidery! You can add your surname or other information at the top. Please note the fabric panel is for you to add to a project of your own. 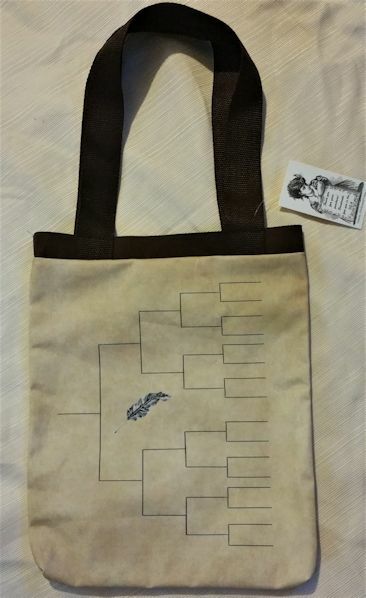 Ready to complete Ancestor Chart Tote 14"x11". 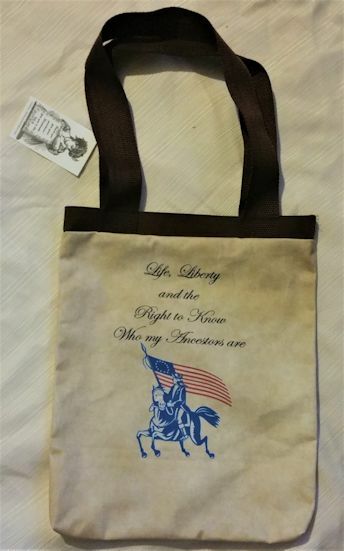 This is our custom designed canvas fabric with Life, Liberty and the Right to Know Who my Ancestors are with a Revolutionary Patriot carrying the flag and the reverse side is a blank chart to complete with your family's name. A sample piece is included so you can test with your pen before you work on your tote. Quilting fabric pens recommended. We did test with a ball point pen and this can be used if you did not want to purchase a fabric pen. Permanent markers or other style pens not recommended.